There’s no shortage of reports lately on the benefits of cycling. Following the “evaluation” (I use the term loosely – see my December 2014 blog!) of last year’s TDF in Yorkshire, the latest comes from the University of Leeds*. It quantifies the economic benefits of more cycle use in terms of health, journey quality and reduced car usage. Whilst not Leeds-specific, the report coincides with plans for a Leeds-Bradford ‘cycle superhighway’ – check http://www.cyclecityconnect.co.uk/ if you’ve not yet seen this. I live beyond Seacroft, and I’d love to use this facility to cycle rather than drive to Leeds city centre. Provided, that is, that I can make it to Seacroft without getting wiped out on the A64. And there lies the critical point – safety. 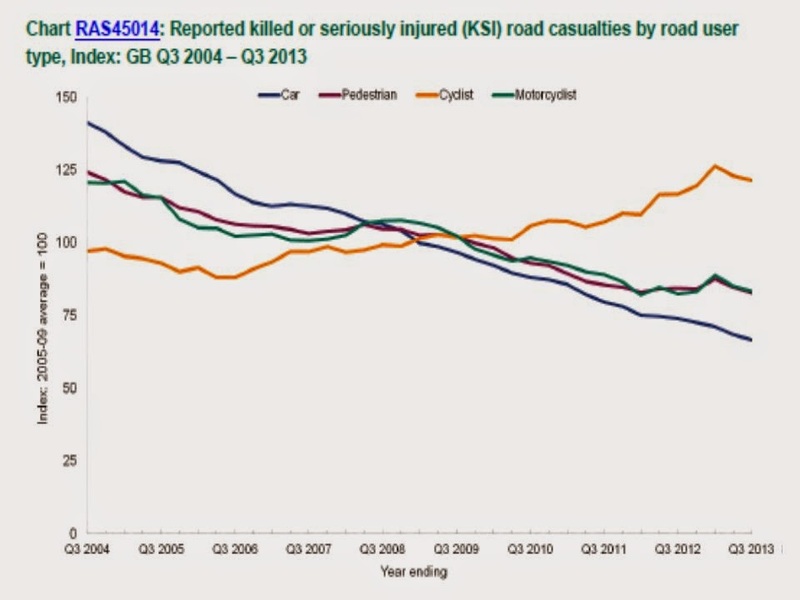 The sad fact is that whilst most road casualties have steadily fallen over the past 10 years, despite an increase in traffic, for pedal cyclists the numbers have risen. Here’s that Office for National Statistics graph from my blog of last June that shows this trend. Any balanced evaluation of cycling benefits must take account of the safety factor, because the huge human cost of death and injury could completely negate the positives. I’m amazed that the Leeds University report takes no account of this (sorry, I don’t buy the “insufficient information to make a reasonable estimate” line, because the report makes big assumptions elsewhere). What is the previous safety record of the two designs proposed (assuming they are used elsewhere? ), particularly where they intersect road junctions? What is the expected impact on car and cycle traffic in the surrounding areas, not just on the superhighway route itself, and what safety implications does this raise? Finally, whilst evidence indicates that most serious cycle accidents are the fault of car drivers, I don’t believe that cyclists are blame-free. Just ask the man I’ve seen cycling in the dark on unlit roads, with no lights, no helmet and wearing dark clothing – if he’s still alive! The cycle superhighway should be matched with an initiative on greater cycle safety – an ideal opportunity for public bodies to partner with the Third Sector, I suggest. I hope that a proper evaluation can show that the superhighway will really work. If it does, you’ll see me and many others cycling more for years to come.